968 km of cycling - as part of a bicycle world trip - from the Peruvian border at Lake Titicaca to the capital La Paz, via the infamous Death Road down into the Yungas in the Amazon Basin, then successful climb of 6,088 m Huayna Potosi near La Paz, back on the bike following the Altiplano southwards to Cerro Rico Mine in Potosi, on a mesmerising ride across salt lake Salar de Uyuni and to Laguna Colorada in Bolivia's very southwest to the Chilean border in the middle of nowhere. 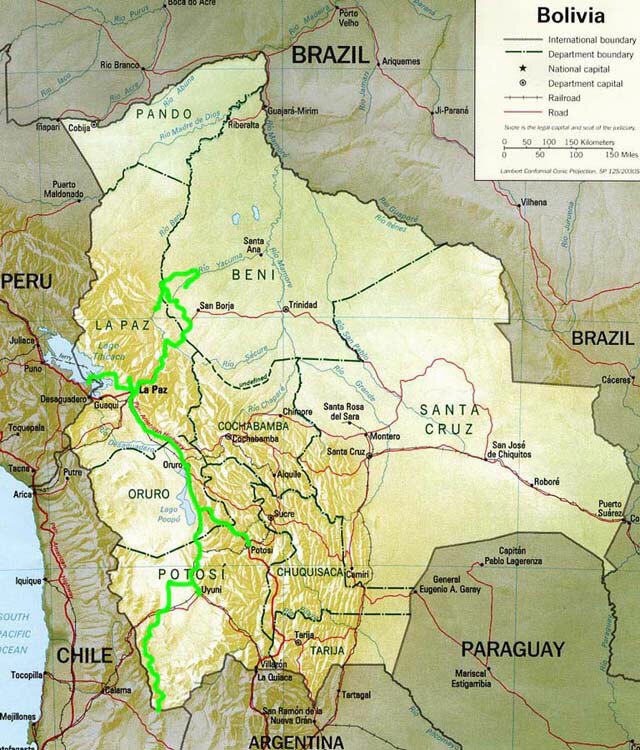 Do you like Cycling Bolivia? I had heard of them days ago, though the level was surprisingly efficient: Having crossed the border to Bolivia, hundreds of barricades on the road to Copacabana at Lake Titicaca slowed me down. Once again Campesinos were protesting against the Church, who tried to get back land, that she once had given to them. Only pedestrians and cyclists were allowed to pass through! So I zigzaged through countless rocks and trees on the road and eventually reached utterly deserted Copacabana. Virtually everything was closed, since tourists rarely made their way here on foot. Except Bartek from Poland, who I had met before in Peru. He arrived next afternoon. But as anyway all shops, restaurants and hotels were closed and as in the evening stones were thrown on a military car and fires were lit on the street, we decided to leave. We prepared ourselves for two days Trekking on nearby Isla del Sol, hopped on a rowing boat and did the entire circuit around and across the island, which was fairly nice, but not that spectacular. Two days later back in Copacabana luckily the barricades had been cleared away. Good for Bartek to catch a bus to La Paz, whereas I started cycling again and another two days later I dropped over the canyon's edge into magnificent La Paz, which spectacularly filled the entire canyon at an altitude of almost 4,000 m above sea level. 3,500 m lower in Yolosa the race eventually was over. It was fairly hot while we were waiting for the bus to bring us in a bumpy 14 hours ride to Rurrenabaque deep into the Amazon Basin. Two days later a tour with guide and food was organised for two days pampa and two days jungle. In the meantime we chased time with some soccer and visits to local karaoke bars. Finally we hit the road by jeep over endless dirt roads to Rio Yacuma, on which we changed to a longboat for a fantastic several hours ride through the pampa. It was surprisingly amazing what could be seen on this boat trip: thousands of alligators, heaps of capibaras and turtles, caimans, paradise birds, storks, monkeys and tucans. Having made ourselves comfortable in the camp, we went for some piranha fishing. Though I turned out not to be that lucky by fishing out of the muddy water just a couple of sardines, the others catched quite a few of them, so we were able to go for delicious fried piranha for dinner! Next morning we went on a walk to find an anaconda and after a couple of hours we were lucky to find one! Except of Bartek and me, nobody wanted to pick it up, this huge three-meter-snake. I did it for the picture, but as she was disgustingly smelly and especially as she started to wind herself around me, surprisingly powerful, I laid her back fairly quickly... While heading back to the road by boat on Yacuma River we stopped for a jump in the muddy water for swimming with a couple of pink river dolphins. Apparently the guides' promise "no es peligroso" (not dangerous) must have been trustworthy, since otherwise I never would have jumped in a muddy river, when there were alligators watching me from the river's bank just a few meters away with their mouths wide open! And probably some of them were even swimming around me anywhere! But the dolphins did'nt come closer, so we went on. Having spent one night in Rurrenabaque we started again, this time by boat on Rio Beni deep into the jungle, where we spent two days with jungle trekking. This was quite nice, but far less animals could be seen. 18 hours of bumpy bus ride brought us back to La Paz, this time on the Death Road's safer inner side. We really had had a great time together and so we eventually came to the conclusion to climb 6,088 m Huayna Potosi together, before heading on in different directions. After two days of acclimatisation and organisation we got started. The taxi did'nt make one steep dirt track because of tons of equipment, so we pushed it up the hill. But one hour later we had the next breakdown, because of a leaking radiator. The driver, however, fixed it, so we made it to the base camp, from where we started walking up in heavy snowfall to high camp at 5,050 m above sea level. At midnight we started heading to the summit. Bartek, Andy from USA and me with guide Miguel as one of the teams. In fact Huayna Potosi could be climbed without technical ice climbing as it had been necessary at Tocllaraju in Peru a couple of weeks ago, but at least one ice axt was needed to pass some of the glacier's steeper sections and one probably won't make it to the top without it at the last steep and huge wall, which we reached just after sunrise. Quite exhaustively we pushed us meter by meter up the steep wall, until we finally reached the summit at 6,088 m above sea level! Later we met Dan and Griffo at the high camp, as they unfortunately had to gave up after three unsuccessfull attempts in the last wall. Even if it was by no means that hard and difficult as at Tocllaraju in Peru, the endless descent and way back to the high camp and further down to the base camp was seriously exhausting. So all of us were fairly tired when getting back to La Paz. But although not all of us made it all the way up to the top, it had been a kind of worthy end of our time we had spent together! The next day it was time to say goodbye to Bartek, who wanted to head back by bus to Ecuador, and to Dan and Griffo, who went by bus further south. It had been an unforgettable and so amazing time! I thought I had to travel alone once again. But just one day after having left La Paz I met Jeannette and Gerrit, two cyclists from the Netherlands, who I had met before at Machu Picchu in Peru. They were cycling together with Harald from Germany since recently and all three of them were travelling now for more than a year as well, they all had started in Alaska. So now we were cycling in a group of four, heading south on Bolivia's Altiplano at 4,000 m above sea level. There were 250 currently active mines in Mountain Cerro Rico. 12,000 people worked in there daily, dynamiting zigzag through the mountain, organised in small cooperatives. The working conditions appeared to be as in the Middle Ages and there was absolutely no coordination and control among the mines. Nobody had an idea about the exact position of all these mines, since there were no geophysical measurings at all! This made it even worse for the miners, as it caused fights between the groups, often with deadly use of dynamite. Being exposed to all kinds of noxious chemicals and gases, destroying the lungs, miners normally died within 10 to 15 years after entering the mine. 2,000 of the 12,000 people working there everyday were children. Chewing coca they digged through the mountain day by day, cause they had no other choice. The youngest were just 10 years old. One of them, who had started with this age, died a couple of days ago, being 29 years old. He had topped his expected lifetime by 5 to 10 years. His nickname was "Botitas" (small boots). During the following days we cycled further south on bumpy and sandy dirt roads towards giant and dry Salar de Uyuni. Having visited Uyuni town and the nearby train cemetary we got started by entering the salt! An unbelievable feeling, hard to describe! Surrounded by surreal landscape and endless blinding white we pedaled across the plain. After countless pictures and stopps the GPS turned out to be right and we could glimpse the island at the horizon. A couple of kilometers later we reached Isla Incahuasi with her giant cacti in the Salar's center. Having spent one night in the Isla's Refugio we went on the the plain's southern bank, again interrupted by heaps of photo shootings. This had been definitely one of the most impressive landscapes I had ever cycled through! Having passed a sandy dirt track, next day the in Uyuni organised Jeep was waiting for us in Colcha K. We wanted to see Bolivia's deserted southernmost part as well and to do this by bicycle would have been a serious challenge for two weeks without any town and almost without any water and food supply on horrible sandy and bumby tracks. We were not too keen on that. So we packed the bikes on the jeep's roof and together with the driver, his wife and his child we went on further south. Passing awesome lagoons with heaps of flamingos, geysers and hot springs we went through bare but fascinating volcano landscape. Two days later we reached Bolivia's southwesternmost area and unloaded my bike as I had planned to cross the border here for heading on to San Pedro de Atacama in Chile. The others wanted to go to Argentina and so they would go on by jeep eastwards for another two days. Once again it was time to say Adios, this time to Jeannette, Gerrit and Harald. It had been such an incredible time, we had had so much fun together! I would miss the laughter and the inspiring talks! Just a sandy dirt track left, uphill to the small Bolivian checkpoint and my time in Bolivia was over. I could have written down more or less the same I had written in my Peru travel report. It had been such an incredible month, not just because of the friendly and nice Bolivians and their amazing and magnificent landscape, but maybe rather because of the people I could travel with.